We must admit more than a bit of surprise here at Ibrox Noise when we heard about someone called Andy Firth signing on the dotted line. 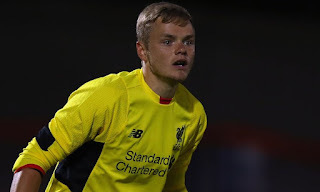 A 22-year old goalkeeper literally no one has heard of, a Liverpool youth who ended up at non-league Barrow, or the ‘National League’ as it’s called these days, and who has suddenly joined the ranks at Ibrox, or is about to, making us completely at a loss as to what happened to trialist Stefan Marinovic, the 24-cap NZ international who was set to presumably replace Wes Foderingham. Probably. Firth hasn’t been signed for the Development Squad, this is a 22-year old we’re talking about, someone who has failed to make the grade in proper senior professional football and somehow Steven Gerrard sees fit to bring him to Rangers? We’re definitely in the dark as to what a National League goalkeeper can bring to Rangers that we don’t already have, and we would really love to hear the reasoning behind this absolutely bizarre signature. We have Wes, Allan McGregor, Robby McCrorie and (presumably) Stefan Marinovic on our ranks already, or will have, in theory. Now we’re adding someone from the national league to give us feasibly five goalkeepers? Yeah, we’re truly lost by this one. Worrell is a young centre half still learning his trade. He will make mistakes, as mccorrie has done plenty of times. It's how he learns from his mistakes, lay off the boy. Mcauley is past it, how old is he 39 or 40. Why we signed him I don't know. Maybe we are going guy for this guy to try and get the average age of the squad down. Maybe Wes is leaving. Even so, it is not an exciting signing!! What a lot of rubbish! It's a made up story. Is it? Where has it came from,any idea? It does seem rather random..
Everybody, stop singing the song about bobby sands. Also, stop singing the song that goes were up to our knees in f****n blood. Sign songs about the club only, then people will stop hating rangers fans. Peace. Young Robby (and Dallas) have joined Morton on loan for rest of the season, so Firth takes his spot as no.3 keeper. If the Kiwi joins then Wes will leave and he'll be no.2.